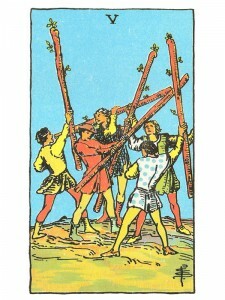 Five of Wands says you are feeling the stress of continuous competition – finding your ideas being continually tested through conflict and disagreements. You see life as a continuous battle. Always question authority – be firm and state the facts to clarify the situation and get the cooperation you require. Every form of oppression is an opportunity for liberation. Overcome the obstacles and you will know victory as you recognize that “negativity” confines your spirit. Discussions can be invigorating, giving you the opportunity to contribute your ideas and teach others what you know – but you must be willing to see a broader picture than just your own point of view. Stop trying to destroy or end the battle – begin to seek to find an outlet that will allow you to compete for the sheer joy of action. Live in the radiance of your spirit and you will soar. Free yourself from your self – made limitations by seeing yourself accurately. Here is the paradox of freedom and uncertainty – a multiplicity of choice at the spiritual level as you have moved on from the foundation of the Four of Wands, yet not far enough to know your ultimate direction. An active pause. Paradox begins to play a bigger role on your path. With the Four of Wands you feel you have a reasonable grasp of the situation – here, you feel humbled by the magnitude of the potential and tasks at hand and to come. Similar to the come-down you feel when you graduate from high school and first set foot on a university campus. Here is where you test your wings to see if you are ready to fly. There is unlimited freedom to choose and therein lies the nature of the new struggle. You must defend your belief structures to date, even against yourself, as you dredge it all up for review. Validation of principles, spiritual options. A possible or likely reordering of priorities. The struggle to rationalize the intuitive. As the self expands, its struggle to include others, principally very close loved one and friends, before it can enter more universal waters. The duality of the Physical/Spiritual. How and with whom are you competing? What obstacles are you confronting? How do you present your ideas to others? With whom are you quarreling or arguing and over what? What are you so excited about? What games are you playing? Next to Hermit: Only you can achieve what must be done – do not rely on others now. Sun and Star to the left and right, or above and below: This lesson will give you a deeper understanding of prosperity. Next to Devil: Do not worry about making amends – no one cares. In the first position: Everything in this lifetime will go towards discovering, then clarifying your spiritual position. You enjoy the challenge of defending your faith, because you always discover new weaknesses in your argument and retire to your theological den to make the needed repairs. In the second position: You could probably talk your way into or out of just about any situation. For just as the snake charmer actually controls the cobra with subtle rhythms, so can you charm your audience when you need to. This is your art. You may or may not have many assets, but you certainly can get what you need when you need it. In the third position: Here comes the tete-ta-tete you have been waiting for. And the timing is right for you. Take good notes for your position as such is not the winner. The contest is a draw. The winner is the one who takes something from everyone who participates and generates the solution. In the fourth position: Passion here can be for the struggle, not for the path itself and you can come to enjoy the combat too much for your or anyone else’s good. Avoiding the responsibilities that come with the maturity of choice. Once we choose one thing, we have not chosen all those other alternatives and must leave them behind, devoting our energies to the one rather than the many. In the fifth position: It is up in the air and where it shall land nobody knows. Even the metaphors are mixed. But you helped toss “it”. Another healthy round of spiritual options, but these are all on the table, in the light of day, an intellectual game of “I’ll show you mine if you show me yours”. In the sixth position: The near future sees you able to slow down in your spiritual affairs, to enjoy where you are for awhile. Others around you, especially your antagonists and fellow players may not be happy with your new schedule. Patience, they will wait. They need you as much as you need them. In the seventh position: Delays may present themselves as moral dilemmas. Let this push you to higher standards. Doing good must be hard, right? Wrong! In the eighth position: Spiritual projects to which you have been committed are not moving at this time or perhaps they may not have materialized as planned. In the ninth position: The heart is enjoying the freedom, the multiple interchanges and variety of energies of a changing cast of characters, as it knows the time is not right or spiritual commitment is still forming. The pieces with which it must merge are evolving also. In the tenth position: The gift here is time, a freedom from the need to make major choices at the moment. But use the interim from pressure to reorder your priorities. That, however, does call for many smaller decisions.